An extreme cold warning remains in effect for Brampton and many other areas in southern Ontario, Environment Canada reported around 11:00 a.m. on Sunday. A period of severely cold wind chills is expected, with wind chill values near minus 30 continuing today. "This bitterly cold Arctic airmass will remain in place through the weekend with wind chill values near minus 30 expected today," says the report. "Tonight even colder wind chill values of minus 35 to minus 40 are expected." 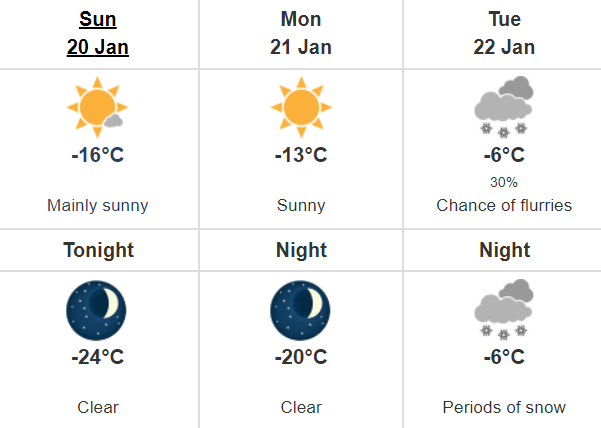 Warmer temperatures are expected on Monday as winds ease, but temperatures near minus 20 or colder are still expected Monday night. A milder air mass will begin to move in Tuesday. Residents are advised to cover up when outdoors and stay inside if possible.